Warsaw-Wayne Fire Territory’s water tank stands guard outside Burner’s funeral mass. 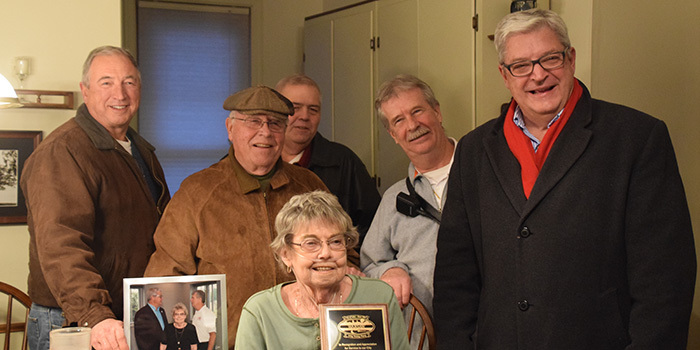 WARSAW — “My water truck … when I die, it better be at my funeral,” said Sheila Burner on Dec. 4, when members of the Warsaw-Wayne Fire Territory board stopped by her house to honor her years of service on the board. 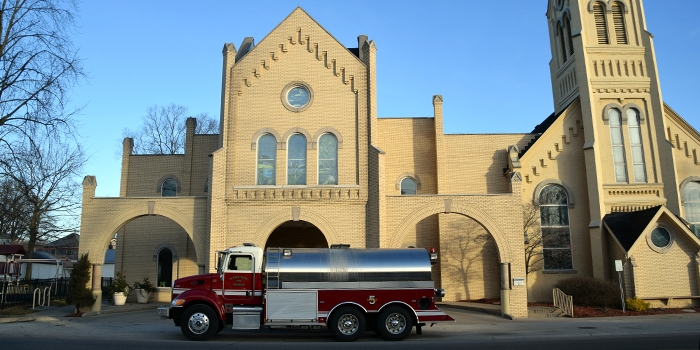 And exactly one month later, Warsaw-Wayne Fire Territory Chief Mike Wilson made arrangements so that her water truck sat guard outside her funeral service today, Jan. 4. Burner passed away on Dec. 22. Burner advocated for the purchase of the 3,300-gallon water tanker, but that was far from the only thing she helped the department acquire during her 10 years on the board. She was one of the founding members of the board who helped form the territory. Most recently, she helped ensure the department was able to purchase the land for and build fire station 3. Along with serving on the fire territory board, Burner also served as Wayne Township Trustee. When she died, she was just days away from finishing her third term in the position. Before serving as trustee she worked for Star Temporary Service as a manager. A resident of Kosciusko County for the last 68 years, she graduated from Warsaw High School in 1958 and then attended Ball State University. She served as the Wayne Township Trustee from 2006 until her death. She was inducted into the Kosciusko Republican Hall of Fame in 2014 for her service to the Kosciusko County Republican Party. Burner was also a member of Saint Anne’s Episcopal Church, CASA of Kosciusko County, Beaman Home, Multi-Township EMS Board and Ladies of the Shrine. “She’ll be missed,” said Wilson during the Warsaw-Wayne Fire Territory board meeting held Wednesday, Jan. 2. Warsaw-Wayne Fire Territory Board Members surround Sheila Burner on Dec. 4, during her last fire territory meeting.